FISHING THE COAST A journal of my adventures. A new month! I am home from my adventure. It wasn't much to do with fishing, in fact nothing, other than talking fishing with friends. I talked to a friend about his annual trips to Alaska over dinner, and that was delightful. I watched the rivers rise over their banks to a churning, muddy, powerful mass. I drove home hiway six, and Gales creek was awesome! It was so full and chocolate colored. Then I turned and went through Timber to past the tunnel on 26. The drive home was exciting. Lots of trees down, and a few slides. I drove through the slide area commanding the hills to STAY! It was kind of scary! The wind was furious, and it was difficult to stay on the road. When I got to the Necanicum I knew that from the level of the river, I was going to be driving through it to get into Seaside, and I was correct. Drove through about a foot of water. It changes the landscape so much when the Necanicum floods and the plains are all soaked and filled with water. It's kind of disconcerting, and beautiful all at the same time. Seven days of rain forecast. I'm going to have to get someone good to interview in the next week. Or if anyone wants to write an interesting fishing article, let me know! I am waiting on one, but so far no luck! I guess for now we can just be disgusted with water levels, and go get that gear ready for Springers! And, the wild run will be here next time the water is down, so don't give up yet! This report is now in three parts! O.K., I now know some new news. The Public Hearing for the Willamette Spring Chinook Season last night: The people in the know predicted a higher run than last year, therefore the Season limit and number of fishing days per week will be liberalized. Comments also on the Columbia Fall Chinook runs predicted to be higher than normal, allowing for more fishing opportunities on the lower Columbia this fall. Just talked to my friend that I have fished with for years, Ben, and he was out at Coffenbury Lake fishing with some power bait, and running his puppy. He said he was out there for about an hour, with some rainbow power bait, just passing time, and all of the sudden his pole moved. He said he thought it was one of the planted steelhead, it fought so hard, and he brought in a 20 inch rainbow trout! He said he had no net, so he had to bring it in on the bank around the docks.. Inside was a rubber worm, and someone else's line! I love that! I always like to check out the stomachs of these fish to see what they are currently feeding on. He also said the meat of the fish was just as pink as a salmon. So this is good news! There are still fish in Coffenbury. I have tried lately, but I was using salmon eggs. That was what got to them in the early fall. I'm trying to find out what went on at the meeting last night at Clackamas Community College. Guess it's time to go down and buy a newspaper. I think the rivers are going down a bit, but not a whole lot. Not fishable around here anyway. There is a high wind warning up for tonight. I have to do some updates on clients pages, and teach piano today, but tomorrow I think I am going to go check out flounder fishing. You know, the exciting part about flounder fishing is that you may very well catch a steelhead by accident! I love that! I have done that before! As soon as I get home, I'll let you know how I did! This had me giggling out of control! It is a letter from a reader/friend, and no matter how disgusted I am about the lack of fish, I AM getting a lot of work done! Anyway, here goes! "Hi Jennie just anote to tell you what I think of the &^%@*&# condition of the rivers. Believe me, Richard, the Steelhead in Coffenbury Lake are almost dead! Well, I can't really say that, but they do dump the old ones in there! They are fun to play with though, if you can find them! The Rainbows, though are pretty nice to eat if you can run into them. Like I said, down below, a friend of mine caught a 20 inch rainbow. Let's see... haven't caught a fish in a while, so I should change that to a 21 inch rainbow, and by the end of the week it will be 29 inches! WOW! That, you see is what happens, when you can't fish.. You exaggerate all of your past catches until you can fill this need to fight a fish! I am fishing Tuesday no matter what! I will fish in scuba gear if I have to! Sorry about the server being down last night. Ifish was down from about 3:30 PM till who knows when, but it's up now, obviously. I was sent some ideas of what to do when we can't fish and I thought I'd share them with you. I got a kick out of it, and anything that brightens my spirits when I have to go through long unfishable spells works for me! On days when the rivers are completely blown out I write my new friend Jennie. about fishing as I am. Working on your tackle has been suggested as a thing to do when you can't go fishing, but it has always made me more depressed if I have to do it too long. My late mother was probably as responsible for me being a fishaholic as anyone. When I was a small (4-5) boy, and she wanted to get me out of her hair, she would fill a washtub with water and float some maple leaves in it. Then she would attach a string and a pin to a willow switch and let me try to "catch" all the fish. I spent many hours at that "sport " . I sure loved that woman. If you get too bored, you might try that. Well, Richard, the tub is still out at our house, and the kids and I are having a great time. The wind is blowing, the rain is constant, but at least I have leaves in a tub. This next week will be busy for me, and even if the rivers become fishable, I'll just have to keep a stiff upper lip, because I have a big production I am putting on with the Missoula Children's Theatre. I have rehearsals all day Wednesday through Friday, and two performances on Saturday. I can't really complain, I volunteered to do this for the school, and the parents club. I'll just have to keep a tub of leaves next to the piano all day, so I can pretend for a while during my breaks. My first thought is to be frustrated. I like it much better when I have fishing stories to tell. Stories of low cool clear waters, and beautiful little corkies tied with small pieces of orange yarn that trickle against the rocks, beneath the water where huge steelhead lie. Stories of rafting down the waters, and gazing into the beautiful green depths hoping to catch a glimpse of a silver flash. Thoughts of trying to place my feet in the raft so that I don't step on a recent catch that swishes back and fourth on the bottom of the raft as we make our way to the next hole. Thinking that if only I had brought a hand warmer I could feel my hands to cast more effectively. The comfort of climbing into a nice heated pickup truck to drive home feeling satiated by the days adventure. Talking to fishing friends on the phone that night, comparing stories, and theories, and exaggerating catches. This all brings me back to stopping at a cafe with my Dad, after fishing a full day, and him ordering me a loggers float. ( A glass of water with a toothpick in it!) Then my thoughts travel to being perched upon his shoulders as the water had risen since our arrival early that morning, on the Sandy river, and he, standing young and still strong in his chest waders, with a stick for balance in one hand, and his other wrapped firmly around my feet to keep me there, with a rod somewhere in between his already full hands, as he waded chest high through very rapid waters to get us back to the other shore safely. My Mother would have screamed if she knew some of the things we did. I merely thought it was all in a days fish! The times we were in the boat, and he went round and round in circles recklessly to show off his new 80 Merc while my brother and I were thrown from one side of the boat deck to the other as we giggled and were thrust about. 'Times we traveled up the Mollala and on the way home, coming down the logging roads he would pretend to me that the brakes went out, and I would be screaming and fearful, and how I laugh at that now. Even though I think it was a little cruel! The things I have done fishing, the things I have survived, and shouldn't have. The fish I have lost, the fish I have caught. The fish I have caught not remembering I forgot to buy my license in January.. (uh oh) The times I have stood out on the beach at Fort Steven's on Social Security Beach, in 50 mph winds, everyone else thinking I was nuts, and I caught my limit in 15 minutes. Then went on to tie a mess of line on the end of the hook, with a little fish bait, and bringing in one dungenous crab after another! Standing on the Jetty and trying to figure out how to net my catch in between huge ocean crashing waves. Dropping and stepping on my sunglasses, losing my gear in the rocks. Losing my fish in the waves. I can't fish today, and don't see anything fishable in the near future. At least I have my memories to entertain me. At least I have several places I can go when I close my eyes. I can close them and think of the thrill that I have found nothing else matches, (NOTHING!) when you are drift fishing and you have no idea there is a fish in those rolling waters, and you feel him, ever so slightly tugging, pulling, testing the line. It's snowing here! I love it! Hey everyone, looks like the weather will be pretty good this weekend! Partly sunny! I wonder what the sun looks like!? I wonder what a fish looks like? Things are looking up. Drove down to Seaside today and took a look at the Necanicum river. It is a beautiful color. High, but nice. Looks to me like fish. Oh yeah, at Peterson Point there is a big fallen tree across the river, so take note if you are wanting to drift. Otherwise the river looks very driftable. Just bring along a chain saw and clear it out of the way for me! Of course, I had meetings all day, and tomorrow I have an 11 AM piano job, and a rehearsal at 3, so that doesn't leave much of a window to fish. Also I have three web page jobs on hold. All of this, with good river conditions makes for a frustrated girl. A friend of mine fished, however, and did nothing. Caught a pretty cutthroat I guess. The river is a little high. Those wild fish should be coming in and I personally want to catch one and ooh and ahh over it before I let him go. I love the wild fish run. I keep thinking I would also like to go out to Coffenbury and catch one of those holdover rainbows that are nearly 20 inches long now. Bring a real ultra light rod, and just have a great time. Tomorrow, however, is definitely a neoprene wader day. It is COLD out there! Waiting on a Nehalem report right now, and will let you know, asap. You know it is very hard for me not to fish. I am so dead tired, and my eyes hurt from reading to much music, and working on web page designs for clients. Yes, I do work occasionally! Please, please! If someone is fishing, and wants to share a story, this is a good week! I feel so out of touch this week with what is out there! I want to run away from home and go fishing! The fact of the matter is, is that my kids come very first in my life. Yes, even before fishing. And they must be fed and watered! This, so they are strong and able to fish like me! Anyway, please, again, email me any updated reports, or fun stories you have so I can fill this space with information about fishing instead of Jennie whining because she can't! Truthfully, next Monday will be the first date that, oh shoot.... Monday there is no school! OK, Tuesday will be the first day I can venture out to my favorite fishing holes. I may drift, not sure, depends on river conditions. I would like to travel somewhere I haven't been in a while, the Wilson, the Trask. Perhaps rent a place for the night, and really check out that area. I haven't been that way all year. So, for now, I have to head off to a little slumber party my boys and I are having. There is a high wind warning tonight, and the location of our house is right at the coastal headlands, and really gets slammed. It IS kind of scary, (Kind of exciting too!) so the boys and I load all of our sleeping bags into one room and giggle until we fall asleep. Good Night! By the way, still no word on the Nehalem. This is what I know. I am a busy piano playing fool this week, so this is all from friends. The Nehalem is looking good, going into the lower 40s where Jim Erickson likes the river level. However, the river was close to good yesterday, and no one was having much luck. Seems the rivers are in fine shape, or nearing there, but the fish are playing the illusive game. The Necanicum also looks real good, but is deceiving. The fish just won't show. They have got to be there! I guess the Nehalem hatchery will be recycling about 200 fish again soon. This, mixed in with the wild fish makes this girl smile. I get to fish next week, so no one is allowed to catch them before me! The weather is looking fairly dry here today, and the water is fine, so all you weekend fishermen, get out there, and let me know how you do! (Just put those fish back for me to catch! Sitting here trying to dry the polish on my fingernails for my performances today. Typing is good for that. Just a note for all of you fisher MEN out there! Hee Hee! I wish my hands were freezing cold and smelled like fish eggs! Or maybe sand shrimp and smelly jelly! It's a beautiful day on the coast! The sun is shining! I haven't seen the sun in ages! And I get to sit in a dark orchestra pit! Oh well, the show is going well. Three shows today and one tomorrow and then, get ready... FISH! Heard of a couple come backs caught on the Necanicum. That's about all I know. I feel so out of it. The rivers are supposed to be really nice. I want to put my life on fast forward to Monday, when I get to get out there and FISH! Well, I hear they are knocking them dead... Oh I don't like that saying.. I hear they are doing real well on the Nehalem. Yesterday I heard of more limits than I can remember. Fishing should be real good today. I haven't got a report on the Necanicum. I, however, can't believe it. There is a storm coming in, and I could fish all week, but NOOOO! I see the scenario already. The storms come in, the snow melts on the mountains, and the rivers are flooded. I can't believe it! Every time a window opens for me to fish, this happens! There are sturgeon in Tillamook bay, there are steelhead in the rivers.... and the weather turns bad! God's way of protecting the species? Am I being paranoid? I had a dream last night that I was at Jim Erickson's on the Nehalem. .I arrived just as he was pulling his raft up after a trip, and Bill Hedlund and I had just shown up. The clients Jim took had buckets on their heads, (!) and were covered from head to toe with mud, and soaking wet. See, I went to bed last night thinking about the wild weather forecast, and me not hitting the rivers at the right time. Anyway, these mud covered folks had a boat full of fish, so Bill and I decided to take the raft and go for it. It was raining buckets, and the river was turning into a boiling mudslide. Unfortunately, I don't remember the outcome of our trip, so I can't tell you any premonition I might have had, but I really doubt that the rivers will be in any shape after they start to rise tomorrow. Seems my fishing reports are turning negative lately, and I am trying to remain hopeful for me! Oh well, just as long as I continue to hear good things from those who have caught the rivers at a good time, and have sent me happy fishing stories, I will be content. I really should oil my reels, organize lures, and reread some fishing articles that have my attention. Smile Jennie, smile. I am. I am trying. Hey there all! I hear the Necanicum is in beautiful shape, heard of three caught in the last couple of days. The Nehalem is still muddy, and the South Fork is way out. Someone was talking about the Siletz being the place to be right now. The Wilson, the Trask, not many good reports. Big Creek is fishable. That's about all I know about the conditions. The weather here is partly cloudy, with some small hail, so I don't expect the rivers to rise much. This system coming in tonight is supposed to be the last in a series, and then drying, so this weekend might be a good time to get out there and see what we can do. I spent the day yesterday cleaning up old reels, and oiling them for my kids use, and putting together some rigs for flounder. Went through a couple buckets of miscellaneous tackle and sorted through it. Found things I thought I was out of! Kind of nice! Anyway, I am going skiing this weekend, so I won't be on the rivers. I may be going out on Friday though. Happy fishing! I am still freezing! I got up this morning really stressed about everything I have to do to get the boys ready for skiing this weekend, and couldn't take it any more. Had to fish. HAD TO. I had no choice. Having a limited amount of time I decided to go out to Coffenbury Lake. Mind you, it is pouring down rain and windy. I stopped at the store. I was desperate for a fish. I bought rainbow power bait, (A sure bet last summer), some night crawlers, and some extra hooks as I was running low on small hooks. I packed some silver eggs from this summer, and off I went. Not a chance I was going to be caught without the magic ingredient. Thoughts of David needing new ski gloves, and trips to the bank were drifting away a bit. I pulled into the office at the park, because I had been meaning to buy a year pass since November of last year. The office said open at 8 and it wasn't. As usual! So, I wasted another 3 dollars on a day pass, and headed out to the main parking area. By the way, do not ignore this day pass rule. They WILL catch you every time! Buy a year pass, much easier and less expensive. Not a soul in sight, but then, who else besides me is crazy enough to fish for planted steelhead or holdover trout in this weather? First I took one of those long lively night crawlers, and threaded all but a little of the worm on the hook, then I took a hypodermic needle, and filled the rest with air, so it would float up off the bottom of the lake. I waited.... no luck. Is that water in my boots? OK, I'll try a nice big piece of this power bait. The whole dock area was flooded with water, and I realized my knee boots were leaking. Starting to get a little cold. Sit very patiently and wait..... no luck. Silence. Just the sound of the distant crashing waves on the beach, and artillery being fired at Camp Rilea.. The ski trip responsibilities win the wait. I was too cold. The fish were not quick enough for me today. I did however go back to the car, dang, my hands are so cold I couldn't open up my car! Drove it up to the boat ramp, casted out and sat in my car with the heater on and my pole out the window while I warmed up. That didn't get me any fish either. Well, that was my day today. Didn't get the ski gloves or the bank trip done either. Now I have to teach some piano lessons, so tomorrow is hurry up and do 10,000 errands day, and then teach piano again! Hope you all catch some fish this weekend. I think I'll bring my rod skiing and perhaps troll down the hills for snowfish. Well, I'm finally packed and ready to go, and as usual, before these planned trips, I am exhausted! I love to just pick up and go, no notice, fishing, anywhere, but planned trips make me get too meticulous, and I pack everything, plus the tackle box! 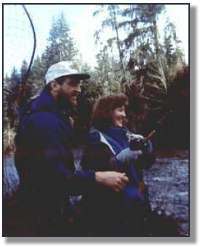 I'm really excited about the prospect of sharing fishing reports on ifish from guides from the Guide Shop in Tillamook. I hardly ever get down there anymore to fish, although I plan to. I just can't keep up with everywhere though, and this will be really fun to be in the know of it all! Anyway, time for me to hit the hay. Up and out really early tomorrow. I know I will have a good time skiing, but why aren't we going fishing? OWIE. I can't hardly move. My shoulders, my legs.... Skiing hurts, but it was SO fun! Got stormed out today though and came home. How is the fishing? The rivers are all out again, and expected to worsen! So as you all can see, nothing is new! On Sturgeon fishing...Someone wrote to me asking, since smelt are scarce, what to use instead. I always do well with squid, or squashed herring, either whole or cut. I was amazed to watch how some people threaded these prawns so neatly tied onto their hooks off of the Columbia river beach at parking lot D. I love that kind of art! Iv never used prawns, but they seemed to be doing well. The nice thing about squid is that it is not so messy, and it seems that always at high tide the buggers nip at your best smelt. Nothing makes me sadder or more poor! Squid stays on a lot better, as does herring. This gets me to wondering how they are all doing, the bank sturgeon fishermen. I think I may take a ride out to all of the best plunking holes, and report that to you tomorrow. May take my rod along with me also! I mean there is work to do here, but it IS my Birthday, so I deserve it! Guess I'll go out to D parking lot, and the Washington side, over by the church, and the port docks. I think it may be a bit early, and there is a storm coming in tomorrow night, but maybe I can find the calm before the storm! Off to the showers I go. It's my day today, the kids are in school, and I am going to cruise around and see what kind of fish I can muster up. The rivers are really high, so this is a major challenge. Somehow I feel best about going out to Parking lot D at Fort Stevens, and see what is going on there. There is a heavy surf advisory, or else I would go out to the jetty and get some of those worms off the rocks, and try for surf perch. I hope the Columbia is not rolling mud. It may very well be, so in that case, I will go out to Coffenbury, because they just dumped a bunch of brood steelhead, and it was reported to me, that right off the boat ramp, people were hooking them off to the left in that big still pool. Now that was three days ago, so they have most likely moved now. Nonetheless, we do what we have to do with conditions such as these. Talked to Jim Erickson yesterday, and he was fit to be tied. He has this great place on the river and said he had had 4 or 5 good fishing days since November. Yikes, what a year. For guides, and people who live to fish this has been a tough year. For me, well, I can always stand by a mud puddle and imagine fish in there. Any body of water contains hope! I remember my Dad trying to get me into golf, and all I could do was stare into the water hazards, and wonder what kind of fish were in there! No hope for me, I fish. That's what I was born to do. So tired, but so glad to put up the fishing reports from the Guide Shop! I just finished doing a web page for a client, which always takes longer than I bid for! Yikes! Yesterday I checked out all of the fishing spots for sturgeon, and no one anywhere! Guess the weather scared them all off. There was one guy fishing Coffenbury Lake, but had had no luck, so Hershey, (my dog) and I took a walk around the Lake. Well, halfway around, because the far side was flooded as is usual this time of year. Drove out to parking lot D, and like I said, it was totally vacant. Also went out to the jetty to watch the huge swells. Everything is pretty well washed out for a bit, but this too shall pass! Just thought I'd jot down these few notes even though I haven't got much fishing news! Be patient with the verbiage, as I couldn't type as fast as he spoke! I have a dog, his name is Hershey. I have had this half chocolate lab, and half Chesapeake dog for 14 years. He is my fishing buddy. He LOVES to fish. I rarely fish without him, unless I am in a raft or a boat. He doesn't do well there, he likes to jump out, and then I have to make it all the way to shore to pick him up, and in places like the big Columbia, that scares me! Hershey is going deaf, and blind. He lays around the house most of the time now. But still, the words, "wanna go.." as in "Wanna go fishing?" perk him up to a playful puppy state. I think it hit me, about a month ago, when I was fishing on the Necanicum, and he was sitting there shivering, and looking towards the car that I really realized that my fishing buddy won't always be fishing with me. Oh that hurts. This dog has been with me on the rocks of the jetty, not an easy place for a dog to be, and he fell in his share of holes in-between those rocks. He has been with me on the Warrenton Jetty, in the dense fog when a huge sea lion popped his head out of the water just feet from us, and roared at us! Scared me half to death, and I think Hersh too! He has had salmon poisoning from the time I lived on the Salmon river in Otis, Oregon, and he would drag up spawners and chew on them. I remember sitting with that poor dog day and night, as it ravaged his body. He made it, though. I also remember giving him tomato juice baths to get rid of the stench! Oh YUCK! He has surf fished with me, and actually caught a seagull once! He has flushed out pheasants where I never thought they would be. Hershey survived eating a herring, complete with double hooks rigged for spring Chinook. Passed right through him. What a wait that was. He has gone chasing after herds of elk, and I never thought he would come back. He discovered a bobcat when I had wandered, fishing way to far from civilization one day, and I don't do that anymore! For fourteen years this dog has been by my side. This morning I woke up to him being not well. He is fine now, must have just been a stomach bug, but it made me pause to think. I just love this dog with all my heart. Not only a fishing buddy, but the most loyal friend I have ever had. Those of you who have a fishing dog know what I mean. The day will come when I will head to the garage to get me rod and my dog, who always knows what I am preparing to do, won't be there wagging his tail in fishing anticipation. But as I sit on the river bank, and I reach out my hand to pat his head, and he isn't there, I know I will see him in my memories, and appreciate his loyalty. So today, as he lays down at my feet, and gets up to follow me wherever I go around the house, and causes me to trip over him, I won't grumble. I really love this dog, and I think the feeling is mutual. Be warned not to drift below hiway 101 or Johnson's on the Necanicum. There is a big tree wedged in up river, but across the river at Peterson Point a huge spruce tree that has fallen. People say they don't even know how the fish will get through. Be warned not to drift below hiway 101 or Johnson's on the Necanicum. There is a huge tree wedged in up river, but across the river at Peterson Point a huge spruce tree that has fallen. People say they don't even know how the fish will get through. How irritating not to be able to get into Ifish. Something went wrong with the server this last weekend. However, I have been really ill with the flu or something, so it really doesn't matter. Plus, the rivers are really high, so what is there to fish for? I'm getting excited about springers! Don't miss the warning about the Necanicum, I posted on Feb 27th. Although most of you are done fishing for steelhead there, it is vital you know about the trees across the river, should you want to drift.